If you have not been using an oil to clean your face in the evening, then you desperately need to start! Like Yesterday! Despite what you may think about your most effective skin stripping cleanser, it will not rid you of all of the makeup, dirt, and pollutants that have been congesting your visage throughout the day. In the past, I had developed the bad habit of over cleansing. I was a novice, just beginning my skincare routine journey. I remember using the Clinique makeup removing gel cleanser to take off my face in the evening, and my skin would be left completely dry and tight. Even after that when I used my toner, I would still see traces of makeup residue left on the cotton pad. All of that changed once I started habitually using oil cleansers years ago. I even use them when I don’t have any makeup on. It just ensures that my skin is that much cleaner. The first thing you should know about oil cleansers is that they should NOT be your only cleansing method. They work best and most efficiently as a pre-cleanser. They work to penetrate into your pores and pull out what is trapped, removing all traces of makeup (even mascara), all while conditioning your skin without any stripping. The trick is in finding the right type of oil cleanser. All oil cleansers should emulsify and become milky when they are rinsed off. Your skin should not be left with any oily residue. The best oil cleansers will also always use quality natural oils. These are the only oils that will actually penetrate and benefit your skin. Mineral oil does nothing but sit on top of your skin. It is such a cheap filler oil, I would not want a product that contained it anyway. As a general rule, never buy beauty or skincare products that contain mineral oil, especially expensive ones. If you are on the fence about which cleansing oils to use, I have narrowed it down to my 5 favorites. They are truly the best ones I have found so far. 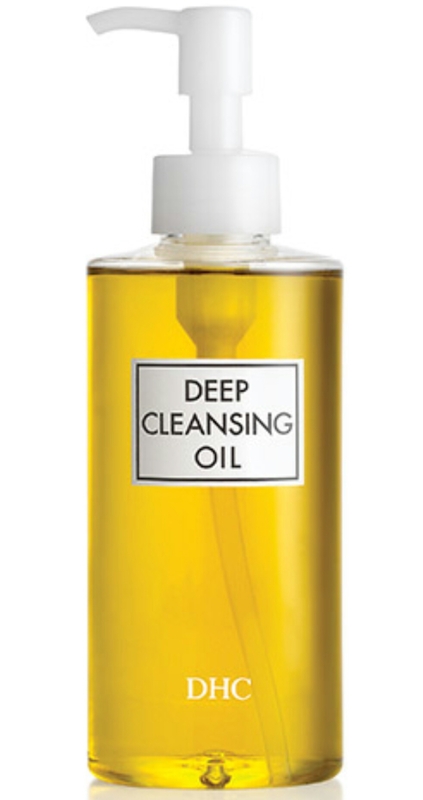 This is the first oil cleanser I ever used, and is still the one I grab when I need some really deep pre-cleansing. I love it for when I need to take off some really potent sunscreen. It is olive oil based, so it is very soothing if you have irritated skin. This oil cleanser is by far the most moisturizing one I have tried. Shea butter as you know is one of the best emollients for skin, so it is my top pick for the cold Winter months. Sunflower oil rounds out the formula along with highly nourishing baobab oil. If you don’t know anything about baobab oil then you are missing out on a prime treat for skin. Baobab oil contains linoleic, oleic, and linolenic acid, which are very concentrated fatty acids. They actually restore the epidermis and maintain the health of cell membranes. Who knew you could get all of that from an oil cleanser! This oil is on the expensive side, but for what you are getting it is totally worth the splurge! You get the benefits of coconut oil, but it doesn’t stop there, orbignya and camellia seed oils blend with brightening oils and ginger extract; which has an energizing effect on skin. If you travel quite a bit, this would be a good pick. It makes my skin look completely refreshed and renewed after using. I almost want to use it as a moisturizing facial oil sometimes. I love how this oil smells! It has a pretty fruity aroma. Anti-oxidant rich grapeseed oil is blended with natural sunflower, argan, and olive oils; and brightening grapefruit seed oil. This is a good choice for Summer since it is so light and silky. This is the latest one I have tried. I am loving camellia oil right now, and that is the main oil in this product along with rice bran oil. I also love anything with green tea, it’s a great anti-oxidant. What’s different about this is that it is moisturizing but also will help to control oil. I would call this a balancing oil cleanser. That means it will be perfectly suited for those that tend to have oilier skin. Acne prone individuals should not be afraid to use this one either. They call it “pure” for a reason. Any of these oil cleansers would be a great pick for everyday use all year round, but I love the fact that they are each a little bit different and would suit certain skin types better than the others might. Awesome! I just hate when you pay so much for a prestige product and it has such cheap ingredients! Mineral oil does literally nothing for your skin except to coat it. Which, I guess if good if you are trying to protect chapped or windburned skin, but petrolatum does a better job at that anyway. Thanks for reading! I understand what you mean about mineral oil. I don’t avoid it but it is ridiculous when I see high end brands use it as their main ingredient. I was so shocked to see the Clarins Double Serum has mineral oil as one of the the top ingredients and they’re charging $88 for that thing! Yeah that is ridiculous! I think it is funny when sales associates get annoyed that I always ask to see the box so I can read the ingredient list! You will love the DHC! I haven’t tried the one from Origins, but I do love their products. I might have to pick it up. Thank you so much! Thanks for reading. You get great samples with your DHC purchase too. I hope you try it, I don’t think you will be disappointing. Thank you! That one is definitely one of my favorites! It makes my skin so dewy and soft. Have you ever tried L’Occitane’s Almond Shower Oil? It is like an oil cleanser, but for your body! It is my absolute favorite body cleanser. I order a few bottles at a time just to ensure I do not run out, and my husband is NOT allowed to use it! Thanks for reading! Do the Winters get pretty harsh where you live? I think you would love the L’Occitane if so. It’s so moisturizing by itself. Check out my blog about dhc products and if you read my first post you can find out how to get four free samples!! Thank You!! !